As I was reading Poisoned Blade by Kate Elliott, I was literally thinking why am I reading this? I think sometimes the OCD is just so strong that I don’t listen to reason. This was next on my to read list and so I HAD to read it. Thus, I pushed through it and read it. Basically so you don’t have to. Poisoned Blade picks up moments after Court of Fives. Jessamy, Jes, is so indecisive about pretty much everything and waivers over everything until the very last minute, that I was left wondering who was more stupid, Jes or me? (Me for reading book two when I really didn’t like book 1.) Jes will continue to remind the reader that she is a general’s daughter and therefore smart, tough, resourceful, etc. Yet, moments later she makes ‘stupid’ mistakes that I highly doubt a general’s daughter would make. I couldn’t root for her or this story. Add the subplots upon subplots upon subplots and I left feeling with why did I even waste my time on this? I struggled with remembering who was who and what side everyone was on. I found myself skimming long passages because nothing was holding my attention. Finally in the last 100 pages or so“stuff” came together but honestly I don’t think suffering through the first 300 pages was worth it. 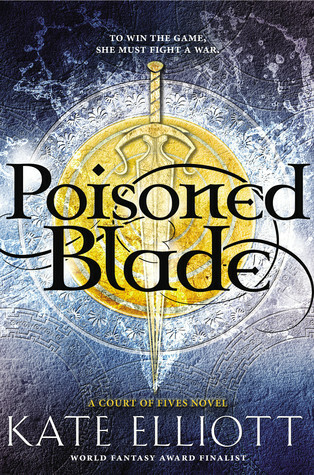 Poisoned Blade by Kate Elliott comes out today. Seriously, don’t look for it. There are so many better books to read such as Every Heart a Doorway , The Lie Tree , or Wake of Vultures just to name a few. This entry was posted in Young Adult and tagged Court of Fives #2, Kate Elliott, Poisoned Blade, Young Adult. Bookmark the permalink.